Campus tours by Student Leaders will help first-year and new students orient themselves to their new home at BU. Tuesday's Orientation is a full day of activities and information that is perfect for new BU students. 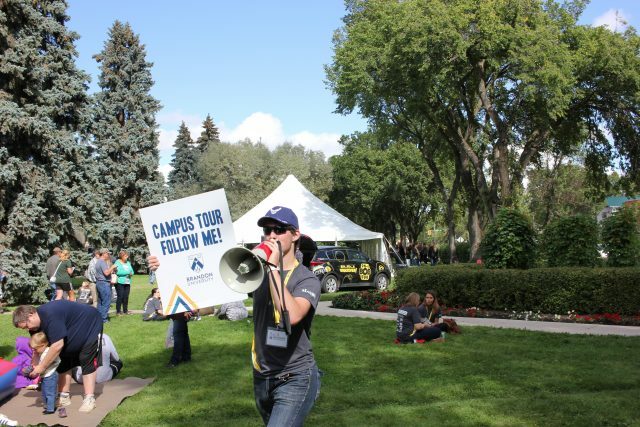 Six hundred eager first-year students will spend an exciting day at Brandon University (BU) on Tuesday, learning their way around campus, how to access supports and services, and hearing an inspirational keynote from Olympic gold medalist Jon Montgomery. While not every first-year student attends Orientation, BU Acting Director of Recruitment, Courtney Adams, says that the day is an invaluable kick-start to their time at university. Orientation events range from fun activities that help students get to know one another, to important introductions to the supports that are available at BU. New students will also be introduced to the services that the Brandon University Students’ Union (BUSU) has to offer. Getting students engaged and excited will be one of Montgomery’s goals in his presentation to students on Tuesday, Sept. 5. A gold medalist in skeleton in the 2010 Winter Olympics, the native of Russell, Man., has also become a popular television personality as the award-winning host of The Amazing Race Canada. Orientation doesn’t end after the first day. Brandon University and BUSU have planned two weeks of food, activities and seminars, including movies, health and safety information, and cultural events. While there’s plenty happening on campus, Adams says that BU is mindful that there is a great deal more going on students’ lives that can affect how successful they will be in their studies. That’s why Orientation takes a well-rounded approach to easing the transition to university.